The long winter is over, and it is finally the first day of spring! With the weather brightening a lot faster than anyone expected, it’s already tempting to get out and enjoy all that Bristol has to offer. For a few tips and highlights, check out our seasonal round up of how to enjoy this great city. Bristol’s green credentials certainly extend to its parks and green spaces, and the spring is the time to make the most of them. From smaller gems such as Queen’s Square or Castle Park in the centre, to the enormous Downs above the Clifton Suspension Bridge, there’s plenty of space if you want to get out and get active. Ashton Court Estate comes into its own at this time of year with its stunning views and bespoke mountain bike trails – or if you fancy a round of golf on the council’s course. For community gardens and animals, check out Windmill Hill City Farm or Bristol Zoo. For the more adventurous, or if you fancy a longer outing, why not try the Frome Valley Walkway. Stretching out into the Cotswold Hills, you can pick the walkway up in Eastville Park and continue through Oldbury Court and Snuff Mills – beautiful, historic estates ideal for family trips out. On the other side of the city the River Avon Trail is an old favourite, passing north up the valley towards Pill and Portishead, with cutback tracks linking it to Leigh Woods. For those going by bike, the Bristol and Bath Railway Path remains hugely popular. Bristol is famous for its graffiti and street art, and there’s no better time to explore what’s on offer. Stokes Croft is a good place to start: not only will you find plenty of Banksy’s early works (Mild Mild Westis here) but also plenty from the Nick Walker and 3D era. Alternatively, head to North Street in Bedminster for a whole host of work running east from the Tobacco Factory, where many up-and-coming talents cut their teeth. Elsewhere, Park Street has a number of highlights (Banksy’s Well Hung Loverand Police Sniperamongst them), or for those who prefer a hunt Easton has plenty to unearth. 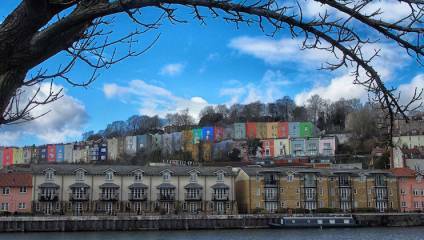 If street art’s not your thing, Bristol has plenty of public and private galleries to visit. There’s the Royal West of England Academy which hosts various major exhibitions throughout the year, and the Arnolfini, which pitches itself as Bristol’s home for contemporary art. Also worth a visit are Spike Island for contemporary work, Centrespace and Lime Tree Gallery, and Bristol Museum & Art Gallery. For an outing with historical weight, take yourself down to the SS Great Britain to see one of Brunel’s finest works, or step aboard The Matthew, a replica of the ship that carried John Cabot on his famous voyage to North America in 1497, which regularly moors in the Floating Harbour. Finally, if you want to learn more about Bristol and its culture and history, look no further than M Shed– and why not try a ride on the restored steam train out front!